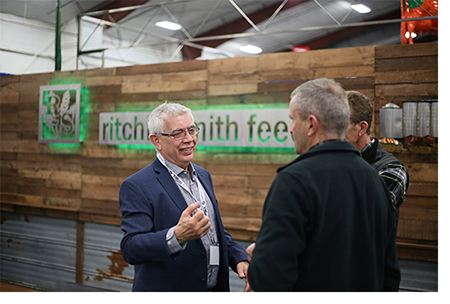 Since 1968, Ritchie-Smith Feeds has been dedicated to building long-term customer relationships based on trust, value and service, while providing the highest quality, safe, nutritious feed products in BC. Being locally owned and operated, and based in Abbotsford, BC, our dedicated team of 90 employees, including nutritionists, field consultants, and manufacturing, delivery and support staff work hard each day to advance and achieve animal health, nutrition, productivity and specific on-farm goals. Guided by our values and commitment to our farmers, ranchers and poultry producers, we provide industry-leading service, products and innovations. We are dedicated and loyal to the BC agricultural industry, and we're very honoured that many of our customers have been with us for 20, 30 — even 50 years! Through our vast experience, industry-leading practices and standards, systems and technologies, two state-of the-art mills, and highly advanced, evidence-based nutritional concepts, we're able to provide customers consistent, top quality feed, unrivaled expertise and service, all at competitive pricing. Ritchie-Smith Feeds' sister company, Sure Crop Feeds, services customers outside the Fraser Valley, throughout Interior BC. To discuss how we can help you maximize the health, nutrition and performance of your livestock, contact us.